Most PGA Tour players and top amateurs spend a lot of time on their grip, stance, posture, alignment and ball position. Then the backswing takes a lot of time and attention. Working on your set up and backswing fundamentals will pay off when the pressure is on. One common fault I see young, medium and more mature golfers make when trying to get more power-they try to make a bigger backswing. Too often I see them take their hands back waist high then they lift them up-disconnecting their hands and arms from their body. They lose power because their weight stays too much on their front foot. I like to see my students turn their shoulders to the right and feel like their hands stay low and extend. I try to get them to not think much about their hands, arms or the clubhead-never feel like they arelifting up in their backswing. Turning and stretching is what the powerful, effective swing is all about. Keep your head behind the ball and let it go! Get in front of a mirror, your patio window or take some video (preferably with your PGA Professional) to check your positions during your swing. Practice diligently, give your swing changes some time, and be patient! As always, we hope this tip helps you enjoy this great game more this season. 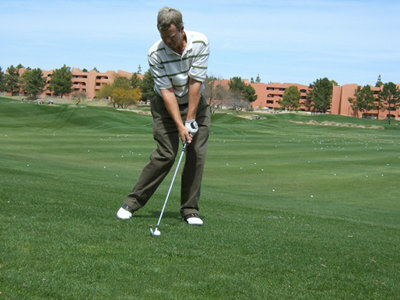 See a Purtzer Golf Academy highly-skilled PGA professional to make sure you are working on the correct technique to get your game to the next level. Champions practice with purpose and patience! When PGA Tour Players and top amateurs make swing changes, it can take days, weeks and sometimes even months for the changes to take hold and become comfortable and repeatable. When I played the best golf of my life (shooting many rounds in the 60’s –with some the low to mid-60’s), I got great advice from my instructor and worked many hours on the fundamentals of the game-on the lesson tee, on the practice tee, on the course, in the back yard at night, in front of the bathroom mirror, etc. The persistence, hard work and patience paid off! Many golfers never reach their potential because they are looking for INSTANT IMPROVEMENTin their golf games. Unfortunately, this rarely happens. There is no substitute for sound fundamentals-combine them with desire, hard work, patience, persistence and finally seeing yourself being successful at the game.